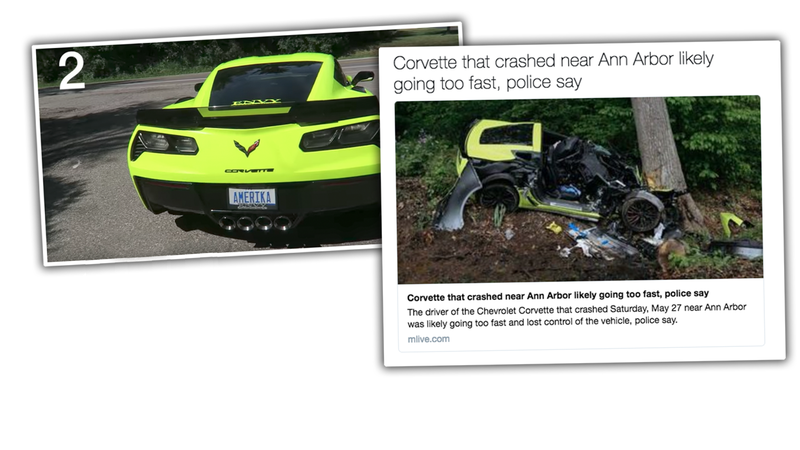 Back in May, we reported on an acid-green Corvette Z06 that crashed into a tree in Michigan after excessive speeding, which smashed the car to pieces and left the two passengers inside with broken bones. The driver, Jie Fu Gong, 22, has been sentenced to nine months in jail. Washtenaw County Judge Archie Brown said that if Gong was going to drive recklessly, he would also have to “pay the price,” reports the Ann Arbor News. In addition to the jail time, he is also sentenced to two years probation, where he will be barred from driving a car without written permission from the court, forbidden to have any contact with his passenger, the 17-year-old girl, and ordered to perform 100 hours of community service. Gong was going 125 mph in the Corvette five seconds before the crash and hit the tree while going about 90 around a turn. Gong’s passenger suffered “two broken femurs, a lower leg fracture, a broken orbital bone and a broken nose.” Gong also had broken bones. The Ann Arbor News reports that the Assistant Washtenaw County Prosecutor Michael Doby wanted a year-long jail sentence for Gong. The probation department said six months, but Judge Brown ultimately decided that that wasn’t enough.